Recognizing its importance as a tool for vascular risk alignment in patients with diabetes mellitus, Profil Germany has worked with trusted partners to develop full competence in retinal laser scanning. We can integrate this technique into clinical studies and research on the development of diabetes. Intensive research in this area has shown that alterations in retinal blood flow develop early after the diagnosis of diabetes mellitus and precede the remodeling of the arteriolar wall. One of the earliest features of vascular dysfunction in patients with diabetes mellitus is impairment in the endothelial regulation of local blood flow, most probably caused by disturbances in the synthesis and metabolism of endothelial nitric oxide. 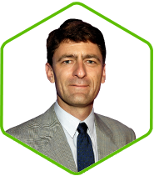 For the investigation of early functional and structural abnormalities, laser Doppler scanning of the retina has been developed and validated in numerous studies. Recent studies have shown that pharmacological intervention with some antidiabetic drugs has the potential to modulate retinal microvascular blood flow beyond the effects on glucose metabolism. Laser Doppler scanning of the retina allows to assess arterial and venous microvascular blood flow, the integrity of the neuro-vascular unit, and the angioarchitecture of retinal vessels. For the assessment of retinal blood flow, Profil has established a collaboration with the Interdisciplinary Center for Ophthalmic Preventive Medicine and Imaging (IZPI) of the Friedrich-Alexander-University in Erlangen-Nuernberg, Germany. A retinal sample of 2.56 x 0.64 x 0.30 mm is scanned for 2 seconds at a resolution of 256 points x 64 lines x 128 lines. The confocal technique of the device ensures that only the capillary blood flow of the superficial retinal layer (300 µm) is recorded. The records are stored and transmitted electronically to the Interdisciplinary Center for Ophthalmic Preventive Medicine and Imaging which serves as the reading center for the analysis of retinal microvascular blood flow and the calculation of the retinal wall to lumen ratio (WLR). Analysis of perfusion images are performed offline with automatic full-field perfusion imaging analysis (AFFPIA). This technology allows the calculation of retinal blood flow in a perfusion map excluding vessels with a diameter of > 30 µm, without lines with saccades, and without pixels with inadequate reflectivity. 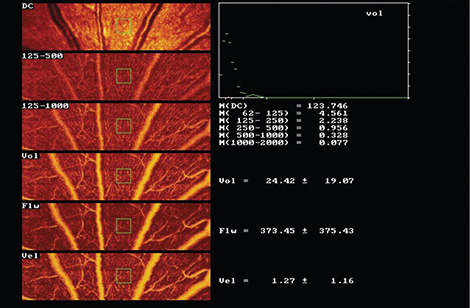 The mean retinal capillary blood flow is calculated in an area of interest and expressed as arbitrary units (AU). To investigate the functional integrity of the retinal microcirculation a retino-endothelial reflex arc is stimulated by the application of flicker light (10 Hz over 3 minutes; Photo Stimulator 750, Siemens-Elema AB). Vessel diameter analysis is performed with automatic full field perfusion imaging analysis (SLDF version 3.7). The outer arteriole diameter (AD) is measured in reflection images, and lumen diameter (LD) was measured in perfusion images. The wall to lumen ratio (WLR) is calculated as (AD-LD)/LD.